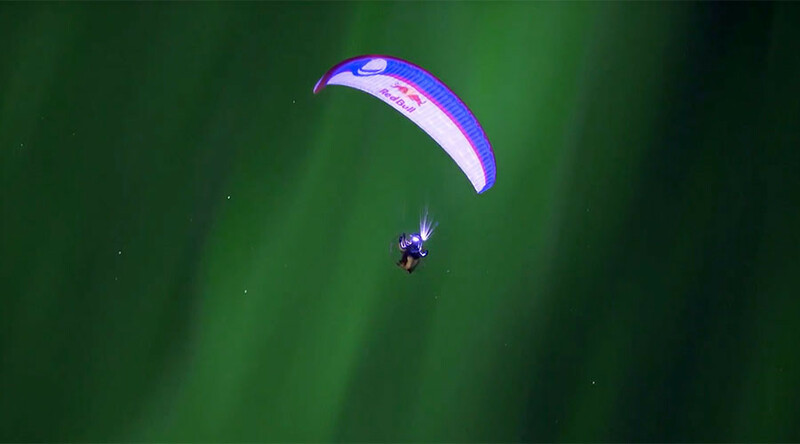 The world champion acrobatic paraglider, Horacio Llorens, has made another dream of his come true after successfully “asking” the Aurora Borealis for a dance in Norway. The spectacular sight in a Youtube video by Red Bull shows the Spaniard gliding through the Northern Lights near Trømso, Norway. Llorens had to play the waiting game for the lights to shine – but when they did, it was well worth the wait. “She’s shy, I asked her to dance many times, and she took a while to show up – but when she did, she was a beauty,” he said. The once-in-a-lifetime event was made possible by Llorens’ sponsors – Red Bull, paramotor chassis company Kangook and motorcycle engine builder Polini – as well as by the Norwegian government, which granted permission for the stunt. Although it’s easy to forget when watching the beautiful, serene video, Llorens faced harsh conditions battling with ground temperatures of -15 degrees Celsius. He wore a wetsuit and battery-heated gloves as he powered up his Thor200 paramotor and took to the sky, beneath the Northern Lights and over their reflection in the water. The video was made possible due to new, ultra-sensitive camera technology that captured the flight under the lights in real time, rather than in time lapse. The professional paraglider is a five-time world champion and recovered his 2009 Infinity Tumbling world record in 2012 when he achieved 568 revolutions after jumping from a helicopter at 19,700 feet above the Mayan ruins of Takalik Abaj in Guatemala.